At 5,000 ft elevation, Cuernavaca, the capital of the Mexican state of Morelos, is a short 1.5 hours drive south from Mexico City. It has a historic colonial city center, which was once home to the (in)famous Spanish conqueror, Hernan Cortes. Cuernavaca is the place Mexican nationals go for respite to escape from the constant hustle and bustle of Mexico City. Many even retire or keep vacation homes in Cuernavaca. Although the entire state of Morelos was greatly affected by September 2017’s earthquake, the citizens of this quaint city have maintained their optimism through community and resilience. While on contract in Cuernavaca for humanitarian work, I got a feel for the lay of the land. I found it to be pretty similar to Orange County, California or any other large, primarily suburban town. It’s calmer, quieter, with lots of parking spaces and a renowned university. 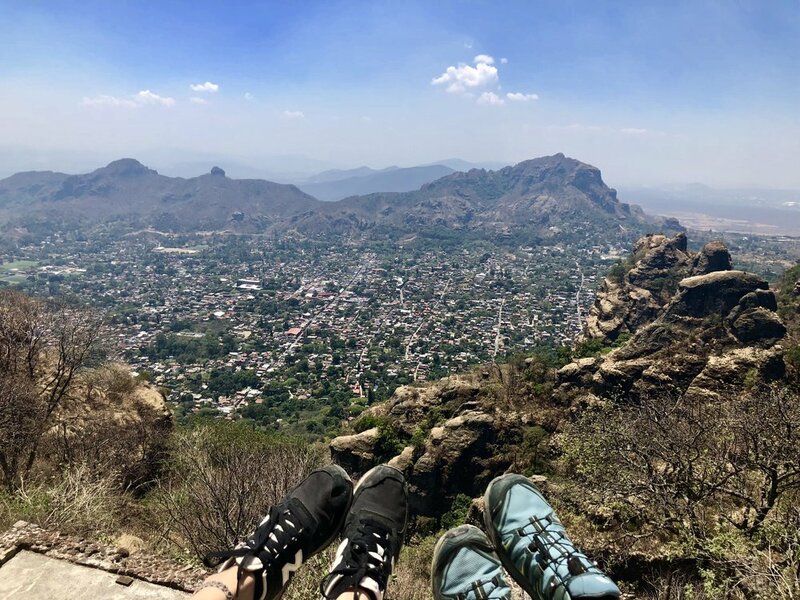 But just within, and outside of suburbia, lies famous colonial buildings, Aztec ruins, as well as the stunning Tepozteco Mountains that cradle the city. Here are my recommendations when visiting the area for a day, or two, or more! Quick tip: Give yourself at least a couple of days to chill and acclimate to the altitude before climbing any ruins, or mountains. You’ll thank me later. Like in the states, I spent many hours working at this local Sbux location. It’s like any other Starbucks, except better, because since it’s in Mexico, they have Pan de Queso (gluten-free)! Though not recommended if you have a lactose intolerance… I know I paid for it later. If you are grabbing your café con dulce to-go, there is also a movie theatre inside of the connected shopping center. Located in the historical square, this hip cafe has plenty of options for coffee loves and alternative milk choices to choose from. I know, I know. But remember, suburban cities need at least one Starbucks per square mile. I enjoyed this location, which has a patio with an amazing view of the historical downtown. I accidentally discovered this cute little cafe while roaming around the city center on one of my days off. I noticed that it attracts young, hip, university students, and hosts various events. There was a book of poetry on every table, and the cook was very accomodating to my diet, making me delicious gluten and dairy-free options. They also offer vegan options too! Open for breakfast, lunch, and dinner, this bountiful buffet is great. Surprisingly, they had tons of gluten-free options, and the kitchen staff was quite accommodating. The reason I found out about this place is because we attended a Feminist Night on International Women’s Day #thefutureisfemale. Our night was full of watching/listening to talented women, and sipping naranjadas (orange juice and soda water). They have a gluten-friendly menu and buffet, and make sure to check out their schedule since they host awesome events all of the time. They are also open for lunch if you already have evening plans. Think of a chipotle, but for salads and less corporate. Fairly priced, considering they use all organic produce. This was my go-to spot for lunch, especially on warm days. Their daily smoothies are amazing!!! 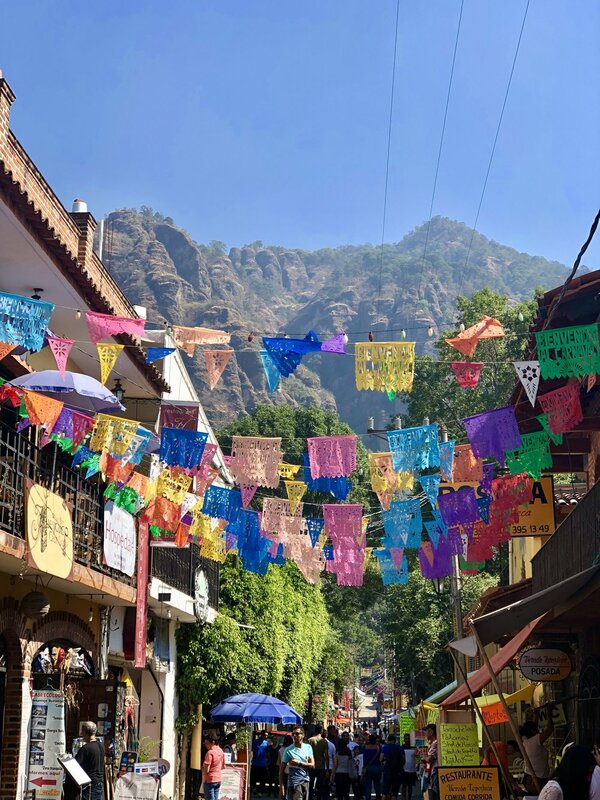 Located at the Pasado de Tepozteco hotel, a colleague took us here for dinner, and it was magical with a grand vista of Tepoztlan as we ate our candlelit dinner. The interior has a cozy, colonial rustic design. The kitchen was aware of my dietary restrictions, and were accommodating. They serve many traditional Mexican dishes, as well as some international fare. They are also open for breakfast and lunch. At the heart of Cuernavaca, the history center seems to always have something going on. It’s bustling with vendors, entertainers, and often hosts festivals. We were lucky that we happened to be doing work at the Starbucks in the square nearby, and stumbled upon a music festival. That’s where I was introduced to my new favorite Chilean band, Miss Garrison. Built in 1526, Palacio de Cortés is renowned for once being Hernan Cortes’ home, and for being one of the oldest conserved colonial-era civil structures in the Americas. It serves as a cultural center and museum, which includes a collection of historical, archaeological, palaeontological and artistic goods from the state of Morelos. 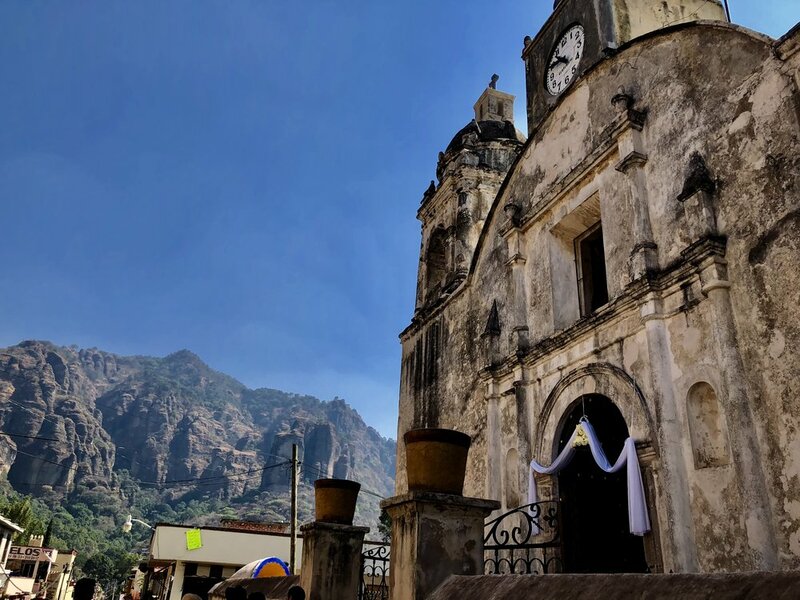 Just an hour away by car, or a couple of hours if you go by bus, is the magical city of Tepoztlan. Let me tell you up front, it was not an easy hike. The altitude and my dysautonomia (POTS) equally challenged me, and I had take a LOT of breaks. Don’t think I could’ve done it without my salt pills or colleagues rooting me on the whole way up. It can seem like it’s never ending, until you finally reach the top. And it’s completely worth it. About an hour south of Cuernavaca, Las Estacas is one of the most amazing places I’ve ever visited. Mexico or anywhere. A fresh, bright turquoise blue mineral river runs through the entire park, and you can swim, take a boat tour, or bring your own floating devices, and/or SUP board. It was perfect for a warm day, because the water stays cold. Don’t forget to jump off the swings alongside the river, and eat at the restaurant on the premises. And make sure your phone is fully charged for all the Instagrammable moments! An Aztec archaeological site in Cuernavaca, which contains the visible ceremonial remains from the Postclassical Period. Not only can you check out the remains, but they are constantly hosting cultural events. I don’t recommend ending up in the hospital, like I did. However, if you do… this is place. Kind, courteous staff considering the circumstances. This mall opened in early 2018, and was still being constructed more and more each time I visited. It is a gorgeous outdoor high-end mall, with everything you will ever need to shop for. The architecture is wonderful, as are both the clothing and food options. Definitely one of the new lifestyle malls you are seeing in many modern cities. I loved this market! It’s a farmers AND artisans market, all in one. Plenty of organic produce and treats to snack on, as well as handmade crafts, paintings, to repurposed furniture. The only thing I regret is not having spent more time there. And more pesos! I hadn’t drank kombucha in months, until a colleague recommended we stop here while In Tepoztlan. Lots of fermented food, organic options, and gluten-free and vegan treats. Great place to shop for food, or snacks while in the Tepoztlán. Only the CUTEST pottery ever. He doesn’t have a storefront (yet), but he is constantly at events and you will find his work in stores around town. Hopefully he’ll start shipping internationally soon!